When you go shopping for clothes, how often is the very first shirt you find something that looks great, fits you perfectly and matches your shoes? 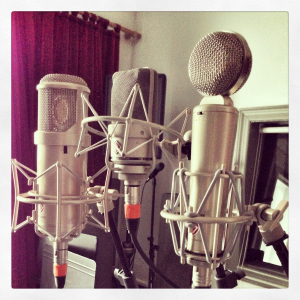 When it comes to recording vocals why should choosing microphones be any different? Every voice, every instrument, and every amp is different so expecting the same microphone to always fit perfectly isn’t logical. 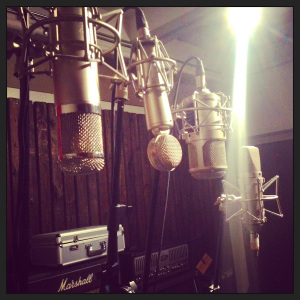 Today I want to focus on the process I use to select the perfect microphone to fit a voice to the song. Gives the vocalist time to warm up and get comfortable. Lets me dial in the headphone mix. Most importantly we can make a fair judgement of what mic sounds the best. The whole process takes up between 2-6 takes on average and we usually stop each take after we have gotten far enough to make a judgement, being mindful to conserve the vocalist’s energy. Space permitting, I like to have all the mics already set up so I don't have to waste time taking one off the stand and putting a new one on - this helps everyone keep perspective. I usually will use the same signal path (preamp and compressor) for all the mics so the only variable is the microphone. After we try all the options I always ask the vocalists if they heard a difference and/or had a preference; usually they'll like one or two mics a little better than the others just judging from what they heard in their headphones. This step is important as it's essential that the vocalist like what they hear while they're recording - it always helps inspire their performance. In the control room, sometimes it's as clear as day which one works best, in which case we immediately get to tracking. But sometimes there isn't a clear favorite or maybe a tie between two mics, that's when we either decide to go with our gut and pick one or we dig back into the mic closet and try another one. There are a lot of problems with vocal recordings that can be avoided not just by careful mic choice but also mic placement and setup (polar pattern, pad, etc). Next week I'll talk more about what to be listening for when choosing the best vocal mic for each session and how to fix those issues as they arise. I like to change out the line up constantly, always trying out different mics on people's voices. It's a great way to really learn what the characteristics of all your mics are and also find the mic that fits the vocalist and song best. In modern music the vocals are often the center piece of the entire production so they deserve the extra time and attention to detail. If spending an extra 10-20 minutes makes the difference between a mediocre sounding vocal and a stellar vocal both sonically and emotionally wouldn't you want to invest the time?